Joe Ciardiello Randy, where art thou? anyone else miss his posts? I sure do. I miss them, too, Joe. Randy was on fire not that long ago. Wassup? Randy, I miss you, too. You've added such a positive presence to the blog. Randy's posts were my favorites on Drawger; it isn't the same since he's been gone. Randy, come back!!! I got to see Randy at his talk last week. It was great but made me miss his presence on these pages even more. 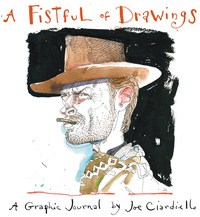 Incomparable stories, equally fantastic drawings... the best entertainment on drawger. I hadn't noticed that much time had gone by, but I can always dig another report from the slanted board of our resident illustration historian. I can always use a hit of Enos. One of the best things about this site. They absolutely should be a book, Zimm. I hope Randy knows that you've compiled them in one place. I miss, Randy. We all miss, Randy. His posts had insight and great fun. It's LumpenWorld around here without Randy! Randy is tooooo funny for this place! Indeed - a Drawger pillar. I think he's been shoveling too much horse poop?